Double Fine's Trenched: Tower Defense With "War Barbies"
Trenched isn't a mech battling game, it's a tower defense game with mechs and loot. Double Fine has revealed more specific details about its fourth downloadable project, the recently announced Trenched. While the game's first trailer made it look like a mech battling game, it's really a tower defense game combined with a shooter and a smidgen of a loot hack. Double Fine talked to G4 about the game's backstory and basic concept. Trenched takes place after WWI and follows two veterans from a listening post that became super intelligent after hearing a mysterious broadcast that killed everyone else within earshot. Frank Woodruff Sr. used his smarts to build himself and other wounded soldiers mechs called "Trenches," while Vladimir Farnsworth invented the television and went insane with a desire to network the entire world. Trenched's enemies are actually Farnsworth's partially mechanical creations that he sends out to lay cable to spread this network and take over the world. However, Woodruff's Trenches are in Farnsworth's way. Trenched plays like a tower defense game but puts players right into the action the whole time. Enemy waves will spawn and a specific area must be protected. As you kill enemies, materials drop that can be used to upgrade weapons, and after a battle the player can collect loot, including rare items. Players will constantly be finding or buying new weapons, emplacements, Trench chassis, Trench legs, and even clothing to customize their marine that sits in the Trench. Double Fine describes the player character as a "war barbie." 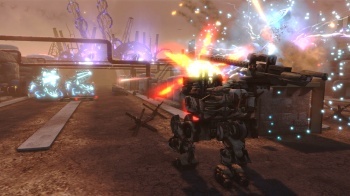 Players can also take on Trenched's campaign in a co-op mode that supports up to four players. Tim Schafer calls the game an "explosion of manly ideals" that have been pent up at Double Fine for too long. It's coming to Xbox Live Arcade sometime in 2011.